This creates a new view named Amesome View for the list on which the api call is executed. The type of this view will be a default view. My question is: is there a way to create a datasheet view using the REST api? I have found nothing on this and I searched for the SharePoint Client ViewType property on MSDN, and it shows that this is a get property, no set available. The GRID value comes from the ViewType enumeration. (Also tried using the in value or lower-case). But all this didn't work. So, is there a way to achieve this through the REST api? To clarify: sadly, CSOM or PowerShell are not an option. I don't really understand if you are able to use CSOM or must use REST. But when reading on msdn there is a class namned ViewCreationInformation which has a ViewTypeKind Property which is get/set. But no it does not seem to be a way to do this when using the REST api. $list = Get-PnPList -Identity "testlist" #Im using PnP to get the list. $vci.Title = "My Awsome View"
When you create a view, the server returns the view. 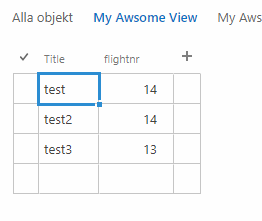 To add, remove, or change the order of view fields for the new view, use the ViewFieldCollection methods. Not the answer you're looking for? Browse other questions tagged sharepoint-online sharepoint-rest-api view json datasheet or ask your own question.